When we told a friend we were going to Hong Kong his first comment was “it’s like Blade Runner in real life.” I wish we had been in Hong Kong for at least one night when it was pouring rain because that would have solidified the analogy, but I can totally see what he meant. 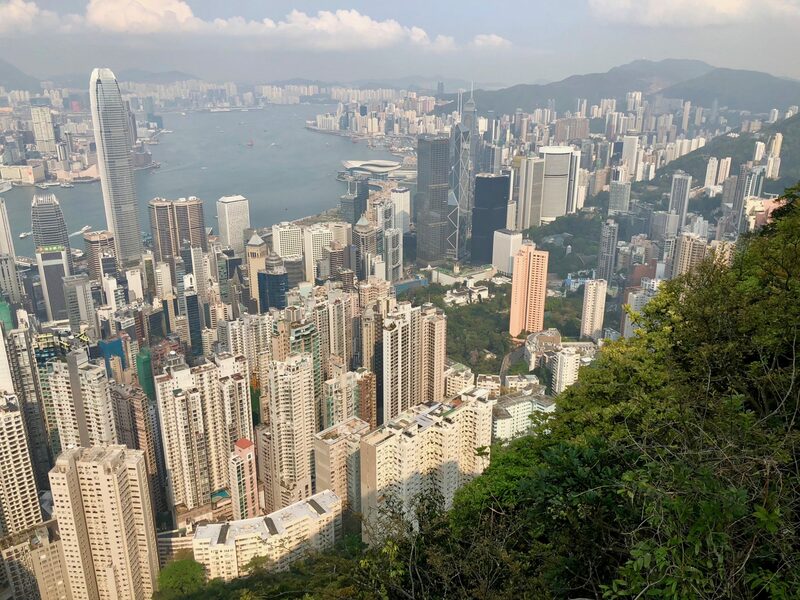 Hong Kong doesn’t have dangerous synthetic humans running around mucking things up, and it’s not in the midst of a dystopian future… but that’s about where the differences end. Hong Kong has the bright lights, big signs, busy streets, the gleaming skyscrapers, and the mansions on the hill. It also has the undesirable grittiness of the Blade Runner future. It’s got the smells, the heat, the weather stained and pollution covered buildings. Luckily the coastal city-state hasn’t yet had to build massive walls to protect itself from the rising sea. But seriously, Hong Kong is amazing place. Its one of the most exciting and dynamic cities I’ve been to. Even with the wildness and initial foreign feel, it’s easy to navigate and very English friendly. Hong Kong has an incredibly interesting pre-colonial, colonial, and post-colonial history. 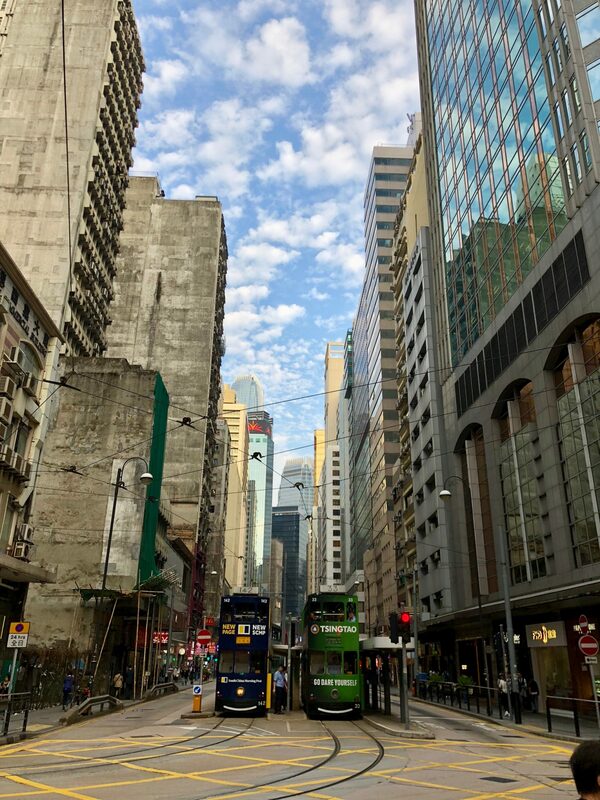 The summary-for 400 years or so, Hong Kong has been where the West trades with the East and even with the political changes, the city still holds this position today. It was apparent from the moment we arrived. The airport is massive for the size of the city because it serves as a hub where westerners can easily connect to local Asian flights. Once I got into the city I noticed that everything is in English and Cantonese, recently China has started forcing things to be in Mandarin as well. Additionally, the British influence is extremely obvious, and as a self-identified anglophile, I love this side of it. Many of the roads, landmarks, metro stations, etc not only have English names, but really English names. Our hotel was in a neighborhood called Fortress Hill, we visited Victoria Peak, crossed Victoria Harbor, went shopping near Admiralty metro, and went to markets near Prince Edward metro. They also use British electrical outlets and they drive on the left side of the road. Hong Kong food can be quite strange. Its easy to find delicious dumplings, buns, and other fantastic Chinese food. But there is also some food that is a strange mix of British and Chinese that can be found at Cha chaan teng restaurants. My favorite dish is a pork chop bake. Its egg fried rice with a pork chop, tomato sauce, and cheese. Its really delicious, not only because its a good combination of ingredients but also because cheese is delicious and fairly rare in Asian cuisine. I’d encourage you to watch these short videos that explain some of the history between Hong Kong, the United Kingdom, and China. They’re all funny, or at least attempt to be funny. So don’t worry about sitting through long, dry, videos 🤓. 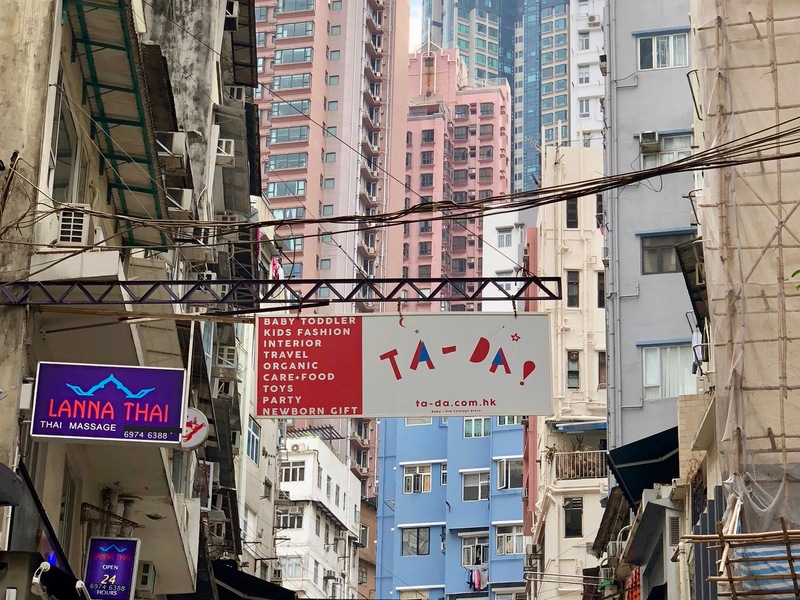 When I was looking for accommodation in Hong Kong, I was shocked at how expensive everything was and how bad everything looked. For reference, in most places Allison and I have been, we could get a clean bed bed in a hostel for about $8 USD a night per person or a double private room for about $20 USD a night. 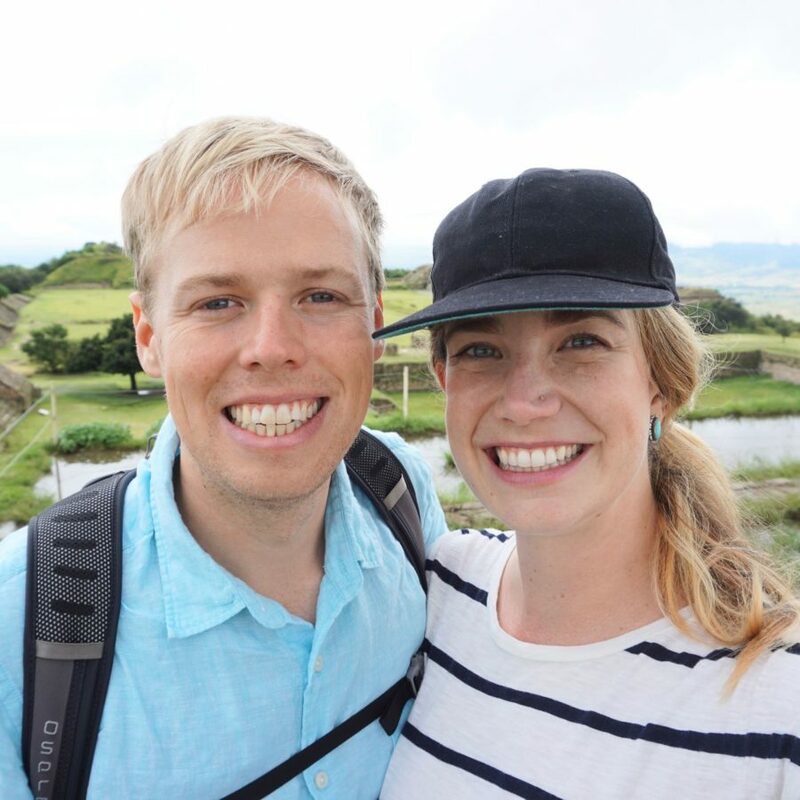 In Seoul, we spent a little more, and then Tokyo was quite expensive at about $50 USD a night. When I was looking at accommodation in Hong Kong around $50 USD a night, everything looked awful. Like we were going to be sleeping with cockroaches awful. We ended up staying at a place called iClub: Fortress Hill and it was fairly nice. The room was about $80 USD a night and I offset some of that cost by using credit card points. So yeah… the most expensive accommodations we’ve found yet on our trip. That said, I was pleasantly surprised to see that aside from the sleeping accommodations, other expenses like food, activities, transit, etc were pretty affordable. There’s plenty of street food in Hong Kong that can be had for under $5 USD. A metro ride is about 50¢ USD. We didn’t take many taxis because it was so easy to get around on the metro and the Ding Dings but when we did take Taxis they were very affordable. 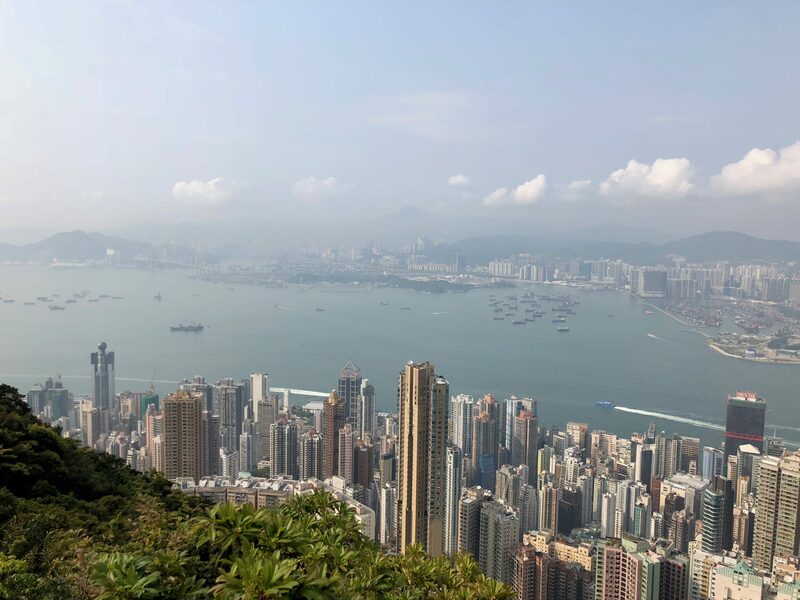 As with all places I’ve been, its possible to spend as much money as desired on food and drinks and activities, but I was pleasantly surprised to see that Hong Kong had daily expenses closer to that of Ecuador than Seoul or Tokyo. The most distinctive thing about Hong Kong are the buildings. They’re everywhere and they’re so tall and skinny! I couldn’t believe how skinny they are, they’re like toothpick buildings. In San Francisco and New York, large buildings take a whole city block and taper as they get higher up. Hong Kong has these kinds of buildings. The skyline seen from Victoria Harbor is loaded with these. They’re huge and gleaming and shining and new. 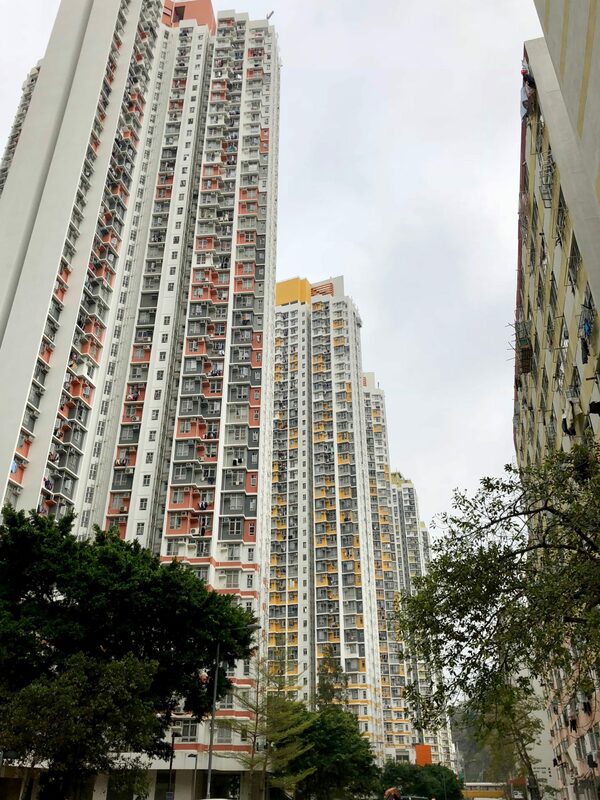 But Hong Kong also has thousands of less glamorous buildings, that take up a small amount of space on the ground and reach straight up to incredible heights without changing size. They’re beige and boring but they’re incredibly tall. They’re also utilitarian, the plumbing and other building internals are mounted outside where they don’t take space away from the occupants and are also easy to access for maintenance. Most of these buildings are some form of government provided housing. Nearly half of the 7.5 million people that live in Hong Kong live in some form of public housing. I love these buildings! They represent living space for the every man in a city. In most western cities, skyscrapers are just for the rich. In the rare case that low income housing is built as skyscrapers it usually turns into a disaster, see Pruitt Igoe and the Bijlmermeer. Somehow places like Hong Kong (also Singapore) have figured out a way to do this successfully and its absolutely necessary. The only way to house all of humanity in a way where we can still get to work, school, and the movie theatre in a reasonable amount of time is to massively increase density. But, I digress. Hong Kong isn’t solving all the worlds problems, but I think its pointing in the right direction when it comes to their buildings. Hong Kong has absolutely wild streets. They’re full of cars, trucks, trains, construction, lights, people, food carts, animals, etc. The streets are incredibly noisy, dusty, and super hilly. I remember experiencing many different smells walking block to block, some good and some bad. That said, the streets are fairly organized. Cars and scooters mostly observe red lights. There are lots of pedestrian crossings at street level as well as below ground. Cars in Hong Kong drive on the left, like in England, and they’re fairly small. Most of the taxis looked like retired Tokyo taxis. They’re the same model of Toyota but they’re not in as good of shape as the taxis in Tokyo. The metro is amazingly good, its super cheap, super fast, and super easy. The stops are all announced in Cantonese then English and then Mandarin before arriving at any stop. The stations and the map copy the style of the London Underground. There is a very large “street” that goes right through the middle of Hong Kong, its called Victoria Harbor. The waterway is pretty much as busy as the city streets. Allison and I took the ferry across because we had read that we should. It’s faster to take the metro but we thought it would be an experience. In San Francisco, I’m used to water crossings taking 20 or 30 minutes for small crossings. This one took less than 5 minutes! The distance between the island and the mainland is so small and boats move across it so quickly. I highly recommend hopping on the ferry at least once. Hong Kong has several markets that take over streets. There is an electronics market near the Prince Edward metro. I thought this market was amazingly good. Unfortunately, I’m not in the market for any cool electronics right now. But if you want something that is fairly pricey in the US, but is kind of commoditized you should be able to find something really affordable at this market. Notably, no-name Chinese drones were all over for half the cost of the DJI and the mainstream brands. There is another market called the Lady’s Market which is a more standard Asian market with cool knockoff logo merchandise. I ended up finding some knockoff AirPods for about $10 USD. They look like exact replicas but are almost double the size. They were totally worth it just for their comedic value. My favorite thing to do while wondering the streets of Hong Kong was to look up. I’ve never been in a city that emphasized the vertical more than Hong Kong. There’s always something above and I always found it astonishing. I really enjoyed my time there. And just for fun I took this short time lapse of our Ding Ding ride. Enjoy!